The Met Office says some roads are likely to be affected with longer journey times by road and bus services. Tomorrow and Friday see an amber 'be prepared' warning of heavy snow for parts of Wales. 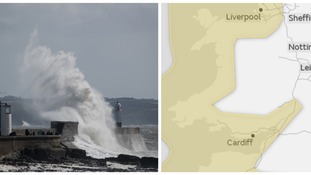 The Met Office has upgraded its warning for Wales to the highest red 'extreme weather' level. As temperatures dip across Wales, the Met Office is predicting snow and very low temperatures for the week ahead. A band of heavy rain, along with the possibility of hail and some hill snow, will move eastwards across Wales. Temperatures have fallen quickly overnight. The Met Office says possible ice on untreated roads and pavements could lead to injuries. The Met Office is also warning that coastal areas may be dangerous as beach material is thrown inland.